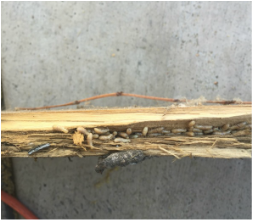 Wood Destroying Organisms - Foss Termite Control, Inc.
A wood destroying organism is any insect or fungus that infests and destroys wood. Kalotermes (drywood termites) live in the wood they infest; typically dry wood, hence the name. The most difficult part of treating drywood termites is locating their colonies. Since they can be hidden in the wood with no apparent signs, fumigation is sometimes the only way to guarantee eradication of the entire structure. Local treatments are available, however they are only effective at the areas evidence can be seen. Dampwood termites are the slightly larger than drywood termites, but have smaller colonies. They will infest wood with a higher moisture content. Removal of the infested wood may control the infestation, though some treatment may be needed. Subterranean termites live in the ground and will either consume wood on or in the ground. They will also build “mud tubes” from the ground up to any wood they need to survive. They are the smallest of the termites with the largest colonies. There is an aggressive subspecies called formosan subterranean termites. To eradicate subterranean termites the infested earth needs to be treated. The specific circumstances will determine the method with which to treat. Though they do not actually eat wood, carpenter ants hollow out sections in order to nest; usually preferring damp wood. They can cause significant damage and leaving behind a sawdust like material containing insect parts. Treatment options vary. Carpenter bees, like carpenter ants, do not eat the wood they infest. They bore into wood to nest with one circular entrance measuring about 16 millimeters (0.63 in) in diameter. They are solitary insects and will not infest the entire structure. Their tunnels needed to be treated with a registered insecticide and the entrance plugged to prevent reinfestation. ﻿Fungus will grow on wood with a moisture content between 20 and 30 percent. Fungi have filaments called hyphae infiltrate the cell wall and consume the cellulose in the wood. The cells collapse and the result is dryrot and structurally weakened wood members. In most cases the infected area or damaged wood needs to be removed and the excessive moisture problem eliminated. If the fungus infection has not yet caused damage and the moisture issue is eliminated, the timbers can be treated with a fungicide.